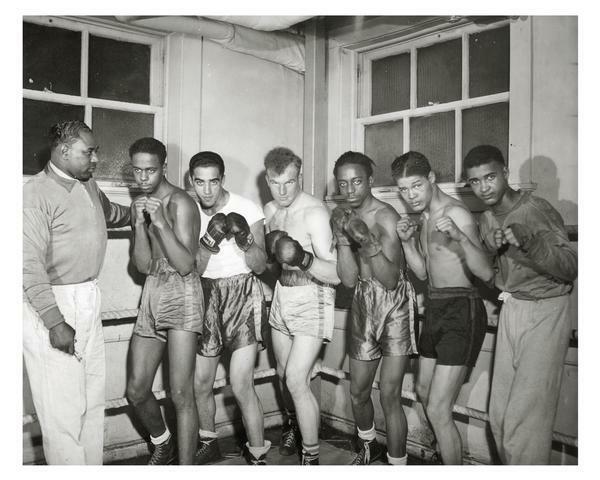 Six fighters in pugilistic poses, in the boxing ring with their coach. The Milwaukee Urban League provided community activities, like boxing, for children and adults. This image is part of a collection of photographs documenting activities of the Milwaukee Urban League between 1919 and 1979. The images in this collection show events and activities sponsored by the Milwaukee Urban League primarily during the 1950s. The League provides vocational and guidance counseling, job training, job development, and a variety of services to families and to the community. The photographs include images of beautification contests in public housing projects, league meetings, and after-school programs.